El Far de Sant Sebastiá (Playa de Llafranc, s/n, Girona; +34 972 30 16 39). Double room from €150. Suite at the Hacienda Na Xamena, in Ibiza. 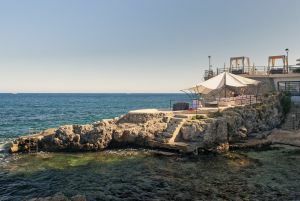 Built in 1971 on a sheer cliff face, this hotel designed by Belgian architect Daniel Lipszyc proved a turning point in the tourist industry of the island. Surrounded by vegetation, the terrace runs down through the rocks on small wooden decks, dotted with plunge pools and waterfalls emulating the gardens of Babylon. The Na Xamena, Rubio, and Eden suites, flanked by baths looking out across the sea, provide a dream view of the best sunsets the island offers. Hacienda Na Xamena (Na Xamena, s/n, Sant Miquel de Balansat; 34 971 33 45 00). Double room from €319. Views from a room at the Hotel Doña Pakyta, in San José, Cabo de Gata (Almería). Genoveses, Monsul, Media Luna, Cala Carbón… These rooms, looking out from a traditional Basque farmhouse, or caserío, offer spectacular views of the deep blue sea of Alborán, which leads to the Strait of Gibraltar. The inside is equally blue. And white, the pute white of chalk. A huge window protects the tables in the dining room, from which can be enjoyed long twighlights that indicate dinnertime in summer. 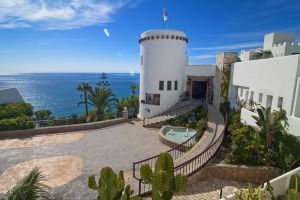 A staircase heads down to the beach, which is almost private, of the most special hotel along Almería’s coast. 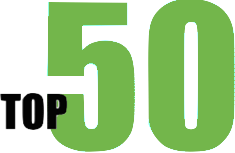 Doña Pakyta (PO Box, 51, San José; +34 950 61 11 75). Double room from €72.25. Hotel Montíboli, in Villajoyosa (Alicante). In the outskirts of Villajoyosa, in Alicante, stands one of the first hotels to be built along the Costa Blanca, and popular with Julio Iglesias and the rest of Spain’s 1970s jet set. Perhaps its most enduring image is the kidney-shaped swimming pool that seems to hover above the cliff face, and it’s hard to resist the temptation to jump into the sea. The Torre Paradís suite is worth spending some time in over the summer months, and its spaciousness, incredible views, and light help forget the austerity of the rest of the hotel. Servigroup Montíboli (Partida El Montíboli, s/n. La Vila Joiosa; +34 965 89 02 50). Double room from €144. Hotel Atlantis Bahía Real, in Fuerteventura. 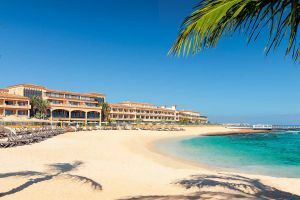 In keeping with the palacial aesthetics of the resorts in the Canary Islands, set amid tropical palms and hidden by the shifting dunes of the Corralejo, the most luxurious hotel on the island awaits, along with gardens, swimming pools, massages, a spa circuit, and a restaurant overseen by Carles Gaig. All the suites, and most of the rooms (the smallest is 44 square meters) have terraces with cane armchairs and views across the ocean to the Timanfaya volcano and the coastline of neighboring Lanzarote. Atlantis Bahía Real (Avenida Grandes Playas, s/n, Corralejo, La Oliva; +34 928 53 71 53). Double room from €244. Room at the Hotel de la Playa, in Pobla de Farnals (Valencia). This minimalist hotel comes as something of a surprise on a coastline noted for its extravagant projects. But this was the dream project of Margarita Sánchez Casares, and she has left her mark in the form of a geometric design highlighted by the Mediterranean light. The sea breeze is ever present, and invites the guest to take a drink on the beach, which seems to come right into the rooms. The underground dining room is lit by a central patio. All the rooms, lined up on two floors, offer fantastic sea views. Blue, all blue. 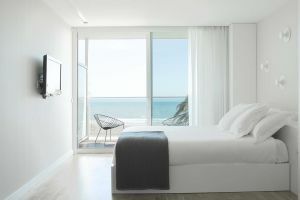 Hotel de la Playa (Paseo de Colón, 1, Playa Pobla de Farnals; +34 961 46 84 64). Double room from €80. 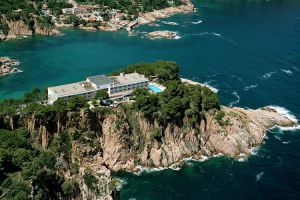 Aerial view of the Parador de Aiguablava, in Punta d’Es Muts (Girona). A getaway from the hustle and bustle of the summer months, this hotel, part of the Parador chain, sits on the Punta d’Es Muts promontory among little-frequented beaches and coves. This is where the Costa Brava hides from the masses amid pines and gardens that tumble down to the sea like some unfinished Salvador Dalí painting. The interior could do with a lick of paint perhaps, but this a hotel that invites the visitor to spend time outside in the gardens, or in the superb restaurant. 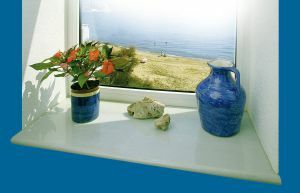 The four suites on the top floor offer unmatched views of the coastline. 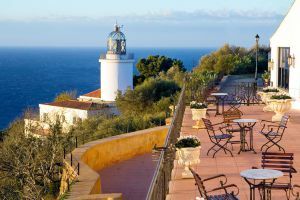 Parador de Aiguablava (Platja d’Aiguablava, s/n, Begur; +34 972 62 21 62). Double room from €110. Room at Hotel Saiaz Getaria, in Getaria (Gipuzkoa). This family-run hotel has two sides. 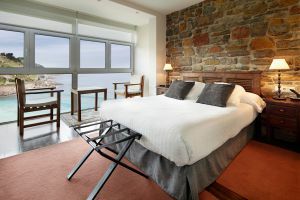 The first looks out to the old quarter of Getaria, in Gipuzkoa, and dates back to the 15th century, with a large fireplace, an elegant wooden staircase, and furniture that sets the tone. The other side is cubic, light-filled, and a modern design looking out to sea. From the Ratón, the hill that overlooks the town, its glass structure can be seen, with its rooms built overhanging an impressive cliff. Saiaz Getaria (Roke Deuna, 25, Getaria; +4 943 14 01 43). Double room from €68. Hotel Villa Rosario, on Ribadesella beach, in Asturias. 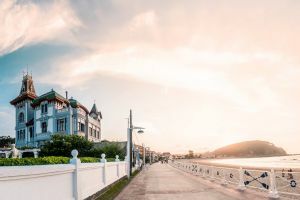 This 19th century villa, built in theIndiano style of the Spaniards who made their fortune in the Americas and returned home to spend it, has been converted into a hotel with six rooms overlooking the Ribadesella estuary and the sea, and a further 11 within. The restaurant looking out to sea offers the best local produce. Villa Rosario (Dionisio Ruizsánchez, 3-6, Ribadesella; +34 985 86 00 90). Double room from €85. Terrace at the Hotel Barceló Illetas Albatros, on Palma de Mallorca. Beach holidays are not necessarily family affairs. This modern complex close to Mallorca’s capital is minimalist, offering rooms with spectacular views, wellness areas, and romantic dinners. The high point are the Deluxe Vista rooms with their own outdoor Jacuzzi overlooking the bay. A temptation that few adults could resist. Barceló Illetas Albatros (Paseo de Illetas, 15, Illetas, Mallorca; +34 971 40 22 11). Double room from €79.20.